Lydney loco shed in the Forest of Dean closed on Saturday 29th February 1964, after which date the locomotive power was supplied each day from the mother shed at Horton Road Gloucester. This latter shed was not so much in the habit of providing us with our usual 57xx Pannier tank but, more likely, any loco that happened to be available which complied with BR route availability. It was to this end that, on Friday 28th August 1964, I found myself in the company of my regular driver Jim Beard on 2-6-2 Prairie side tank 4564. With Gloucester not bearing in mind the importance of clean fires, flue tubes and dry working sand on the Forest inclines, to say that 4564 was shy on steam was an understatement as we started to struggle with a full load of eight bitumen tanks and brake van, heading for the Berry Wiggins Depot just beyond Bilson Junction on the Bullo branch. Entering the eastern portal of Haie Hill Tunnel. The weather was scorching hot as we made our way up towards the first 1,064-yard long Haie Hill Tunnel and I could see that we were going to have problems. 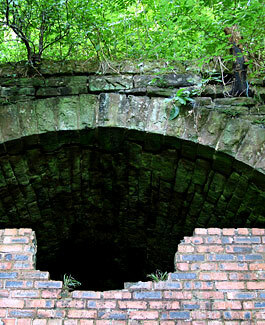 The tunnel was straight from end to end with a passage time of approximately five minutes and caused no problems to footplate men. On the day in question, before clearing this tunnel, the boiler water was dropping and the steam clock was following, while the loco was moving abnormally slowly and the exhaust was barking into the roof of the tunnel before entering the cab. The perspiration was pouring down my face from the super-heated air in the cab and the atmosphere was foul with poisonous gases as we crashed on up the bank. Leaving this tunnel and with only 200 yards to go before the next one, I banged another charge of coal around the fire box as Jim dropped the reversing lever a few notches and put the regulator right across to keep us going. This state of affairs would cause our loco to be working under most undesirable conditions and our aim now was to get to Soudley Halt where we could stop for a ‘blow-up’ and have a chance of getting our train of tanks away again from a dead start. ...and the same end today. 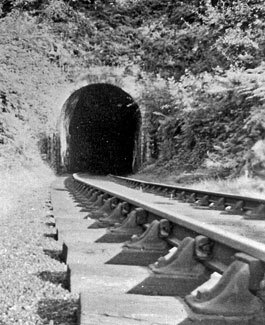 The middle 299-yard long Bradley Hill Tunnel, which we had now just entered, was the worst of the three on this line, with a left-hand bend that affected ventilation. (The 109-yard Blue Rock Tunnel was the final one and, like Haie Hill, gave few problems.) 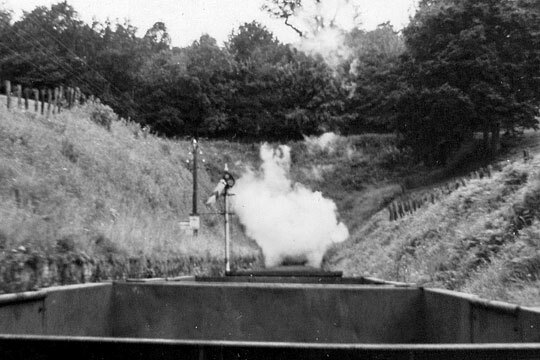 With no ventilation shafts and an east wind, this caused the hot gases to move along these tunnels with the loco. The method now was to dip a patch of cotton waste into a bucket of water, wring out the excess, then cover this concocted air filter with one’s handkerchief and place it over mouth and nose. Halfway through Bradley Hill Tunnel I was on my knees, struggling to breathe. I could feel the hot gases burning the centre of my chest and my clothes were sticking to my body. Our loco was now blasting the tunnel roof with hot steam and gases as we moved barely at walking pace. My heart was pounding as the hot yellow fog drifted over the side and into the cab. 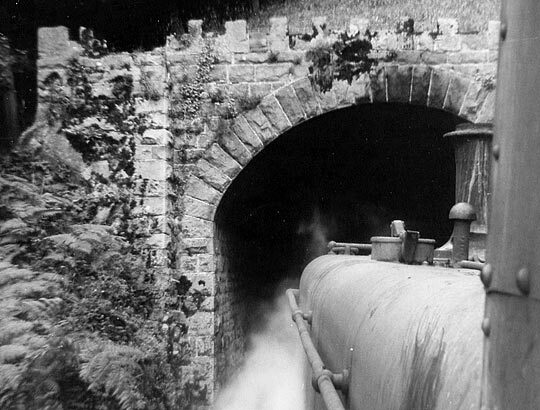 A Pannier tanks enters the south end of the 109-yard Blue Rock Tunnel, encountering its right-hand curvature. It occurred to me that I did not have much choice in the matter as Jim leaned across to hold me to the footplate. I had not enough air in my lungs to fight him and wondered where he had found enough to come across the cab and grab me. I now resigned myself to my fate. I was going to die on the footplate of this loco. After what seemed to be an eternity, we emerged from the tunnel and the eerie yellow fog slid back over the side of the cab from where it had come. I felt as if I had just been woken from a nightmare. Sticking my head over the side of the cab, I noticed that the silver metal of the handbrake had gone the characteristic yellow from the sulphur. As I looked back the smoke was swirling up off the wagons behind our loco as, one by one, they came into view. For the rest of the day and for the first time, I went without a cigarette. Having travelled through these tunnels from the age of ten with my driver father, I had never experienced anything so bad before or since.